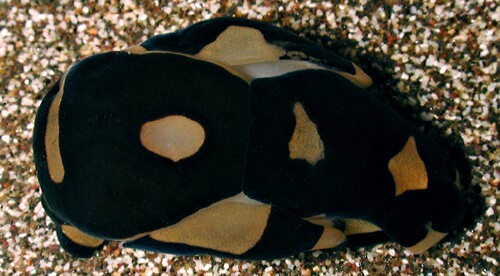 Identification: This is a cream animal broadly reticulated in black. In contrast to Tubulophilinopsis sp. #1, the black lines don't extend onto the foot. Natural history: Tubulophilinopsis pilsbryi is rarely seen on Maui where it has been found only in Halimeda kanaloana beds at depths of 9-15 m (30-49 ft). However, it is locally common on Oahu at depths of 1-3 m (3-10 ft) in Kaneohe Bay and other highly protected sites. It has also been found at Hale'iwa trench to 24 m (80 ft) and Scott Johnson reports it from more exposed sites. Distribution: Big Island, Maui, Oahu, Kauai, French Frigate Shoals and Midway: widely distributed in the Indo-Pacific. Taxonomic notes: It is referred to as "Pilsbry's headshield slug" in Hoover, 1998 & 2006 although the photo is of Tubulophilinopsis sp. #1 in the 1998 edition. It was first reported from Hawaii in Pease, 1860 (as Philinopsis nigra). Pilsbry, 1921 and Edmondson, 1946 list it as both Aglaja nigra and Aglaja pilsbryi. Aglaja pilsbryi hawaiensis Pilsbry, 1921 is a synonym. (Kay, 1979). It's listed in Hoover, 2006 and Gosliner, et. al., 2018 as Philinopsis pilsbryi. Photo: CP: 27 mm: 2006 CREEF expedition French Frigate Shoals; Oct. 24, 2006.